You have spent time and money perfecting your presentation, and all of your hard work is starting to pay off: when you present directly to customers in a one-on-one setting, you can see their immediate interest. When you make your presentation to larger groups, the favorable feedback you receive tells you you’re on the right track. When you speak at conferences, the audience is riveted. You’re delivering the right content, in the right style. Everything is great! The Best Way To Be In MANY Places – At the SAME Time! Live streaming technology is the solution to your problem. The latest advances in technology have lowered the barrier to entry, and it is now easy and economical to get started. If you have a computer, a video camera – even a webcam – and an internet connection, you can use TikiLIVE to help you make your presentation to people anywhere in the world. Access to Emerging Markets Has Never Been Easier – Internet connections, mobile devices, and social networks are widespread in all global regions. Use TikiLIVE to help you share content with people anywhere, anytime. Reduce the Need for Written Materials – You have a great presentation style with those in the room; but to communicate with those far away, you send out printed literature. Is something lost in translation? A written version of your presentation may not be as effective as the one you make in person. Use live streaming to preserve the feeling of one-on-one contact, and to allow viewers to hear your thoughts as you meant them to be heard. Reach distant customers as if you were right there with them. Eliminate Language Barriers – Large cities everywhere in the world are becoming more diverse. We can no longer depend on everybody in one region speaking and reading the same language. For example, many people around the world whose first language is not English are able to understand English, but can’t read it well. With live streaming, they don’t have to read and your message can still get through. No Need to Travel – Do you travel to make your presentation? Do your clients travel to your location to see you speak? With live streaming technology, you can present your content from your home base, and your clients can view it in theirs – and neither of you have to spend time or money on travel. TikiLIVE is a complete set of tools for live streaming video, audio and media over the internet. It’s very easy to get started: all you need is a computer and a camera, and you can be up and running quickly with a basic setup. The software is intuitive and easy to use. If you want further help, TikiLIVE provides a comprehensive set of video tutorials and live support. 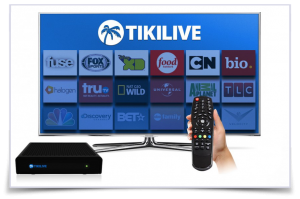 As your requirements grow more complex, TikiLIVE has everything you need for streaming media over the Web in every format. We even provide tools to help you produce and distribute HD Broadcast quality Internet Protocol Television (IPTV) to set top boxes, including the Roku set top box. Here are just a few of the ways you can share your content globally, using TikiLIVE’s suite of products. Live Streaming – As you make your presentation, TikiLIVE has the ability to deliver live video instantly, without first being edited or processed. People around the world can see what you do, when you do it. This mode is perfect for product demonstrations or training sessions. On Demand Streaming – For those who can’t watch your live presentation, TikiLIVE can deliver recorded content. Viewers can see your content at a time that suits them best. Webcast – Using TikiLIVE’s features, you can set up specific times to make live presentations. This can create excitement among your viewers, and help them know when to watch for the next live broadcast. Conferences – Are you presenting at a conference? You can use TikiLIVE to send your content globally, by equipping your smart phone or tablet with an application from TikiLIVE that enables it to stream your presentation live. As more and more features from personal computers are implemented on mobile devices, people spend less time at their personal computers. To share your content globally, you want to ensure your presentation makes it all the way to the mobile devices people have with them. TikiLIVE uses HTML5 to translate your streaming media to all platforms – not just PCs, but to smart phones and tablets, too. We know it’s important for users to experience reliable video, with no degradation in quality as the number of users increases. TikiLIVE’s advanced content delivery network is designed and equipped to deliver streaming video content to your users anytime, from anywhere in the world. We engineered our system to be extremely reliable and robust, and the infrastructure we developed is the best in the business. The whole world can connect to your presentation. Don’t leave anybody out! Take the next step, and contact TikiLIVE. It’s easy and economical to get started, and you will quickly be able to deliver your content to users around the world – in large cities and small towns everywhere, on any device people may own: PC, laptop, tablet or mobile phone. To learn more about the services we offer for live video streaming, and our many other services, call our customer service representatives at (305) 289-4557. You can also start an online chat as well. We will be happy to answer any questions you may have and explain how easy it is for you to share your content with a global audience. We look forward to working with you!